Your genes don't hold the answers to all your problems. Diets have always gone through fads. The grapefruit diet, Atkins, paleo, Whole30 — like a many-headed weight-loss hydra, just as soon as one falls out of favor, another rises in its place. The weight-loss technique du jour: DNA-based diets. 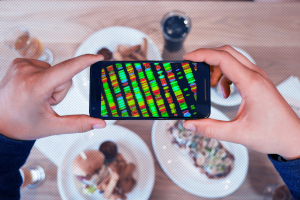 Companies such as DNAFit and Helix suggest consumers pay about $100 and a simple cheek swab; the resulting genomic analysis will purportedly show them what kind of diet will keep their bodies in peak health. Maybe a low-fat diet would work best to help you slim down — or maybe it’s a low-carb diet. These companies claim (with some scientific support) that individuals’ genomic code can hold information about a person’s propensity to obesity – and that the diets they suggest would counteract that. But a recent study shows these DNA-based diets may be just another fad. In the study, published recently in the Journal of the American Medical Association, researchers put 609 overweight adults on one of two diets: a low-fat diet, or a low-carb diet. Both groups successfully implemented their new eating habits, and both lost weight over the course of the year. Using DNA tests, and by assessing a number of other biological factors, the researchers hypothesized whether a low-carb or low-fat diet should work for each person. People in both groups did lose weight over the course of a year: an average of 11.7 pounds for the low-fat group, and 13.2 for the low-carb set. But the difference between how much weight people lost on average was so small that researchers don’t consider it to be statistically significant. And when they compared participants’ genetic analysis across groups, they found no correlation. That is, people seemed to respond about the same to the weight loss regimen, no matter what their genetics might indicate. When you start to think about the effect of the environment on these genes, the picture starts to get way more complicated. It’s all a matter of drawing conclusions from the data that’s available. For now, scientists haven’t been able to untangle all those factors. That will likely change as they get a better sense of the inner-workings of the genome. Yes, these diets could someday be much more prescriptive and individualized. But that day is not today. At least for now, these diets are pretty useless. Here’s some good diet advice: eat more fruits and vegetables. That’s one tidbit that will never go out of style.